Yes, launching a weather balloon is completely safe, but only if you’re taking the necessary precautions. We never launch a weather balloon in an area with congested air space and all our flights include an on-board radar reflector which commercial airlines and air traffic controllers can detect and avoid via a radar operating in the 200 MHz to 2700 MHz frequency range. Additionally, we coordinate with the Federal Aviation Administration (FAA) which includes filing a HiBal Prelaunch NOTAM (Notice to Airmen). This important process informs air traffic controllers and pilots ahead of time to be on the lookout for a weather balloon if their intended flight path may be in the same airspace as our weather balloon. It also gives them a way of contacting us if they need to delay our launch or get an update on our weather balloon’s position. Every week there are over 10,000 weather balloons that are launched by meteorological organizations around the world. There are also an additional 20-40 amateur launches performed every week. That’s over 500,000 balloons being launched around the world every year. To date there has never been a report of an airplane striking a weather balloon. You can read full details about safety and regulations in the United States on our safety and regulations page. How long does a flight typically last? Flights typically last two to three hours. Flight time depends on how much helium we put in our balloon and the size of our parachute. The more helium we use, the faster our balloon will climb. It also means, though, that our balloon will burst at a lower altitude. Typical ascent times are one to two hours. A larger parachute will also increase our flight time by reducing the balloon’s descent rate. Typical descent times are 30 minutes to one hour. The values are calculated well ahead of launch time so we have a pretty good idea of exactly how long the balloon will be in the air. How far from the launch site does the payload typically land? The biggest factor on how far the payload will travel is the jet stream. There are four of them that constantly circle our globe from West to East at an altitude of roughly 60,000 ft. Jet streams can typically reach speeds of over 75 mph and can frequently be upwards of 150 mph. If one of these jet streams happens to be directly over our launch site, the payload could travel up to 150 miles! 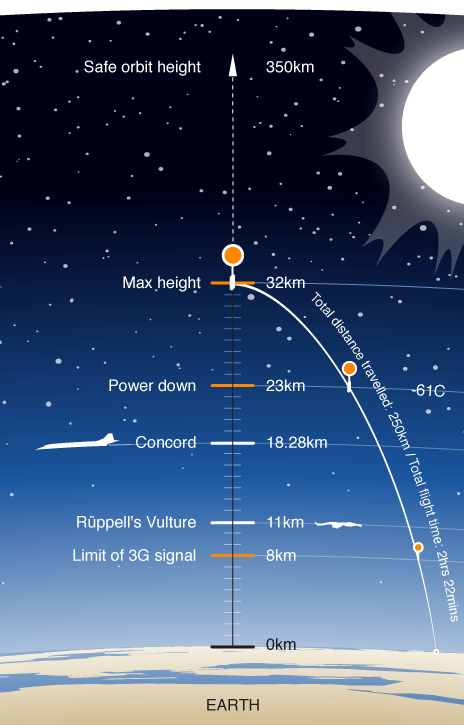 If the jet stream isn’t above our launch site, then the payload could land as little as 5 miles from the launch site. How do we know where the payload will land? Starting 7 days prior to our launch we look up the weather forecast on ground winds and the jet stream on using multiple weather and flight prediction websites. We’ve found that using a combined effort from multiple sources has led to very accurate results that are reliable +/- just a few miles. If our payload is predicted to land near a lake, mountain, populated area, etc. we will typically reschedule the launch or just move the launch site somewhere to accommodate a different landing zone. How do we find the payload after it lands? Our flights include 3 separate positioning systems to help us locate the payload. Primarily, we use 2 different forms of radio communications, which require an amateur radio license to operate. The radio communications provide us constant positioning reports throughout the flight via both APRS and RTTY. This communication method operates at all altitudes even over 60,000 ft. As a backup method, we also use a cellular-based LTE GPS device that is off for most of the flight and automatically powered on when the payload lands, in accordance with FAR 22.925. Once the device powers up, it will report its position as a backup solution. Where do we buy helium? We have several specific vendors in our area, but typically any welding supply store will carry bulk helium. What if the payload lands in a tree? Payloads occasionally land in trees. We’ve been relatively fortunate on OLHZN-7 and OLHZN-9 which are the two flights that we’ve landed in trees. Both were only about 20 feet from the ground and we were able to easily pull them down with a long stick. We have yet to experience a payload stuck in a very tall tree, however, we do have a procedure in place for this. Our recovery team carries a 25 ft. ladder during recovery operations. Anything higher than that, we’ll try to knock it down first, but the safest thing to do in this situation is to have a certified tree climber retrieve our payload. What if the payload lands on a power line? Unfortunately, in our fifth flight, OLHZN-5, we did experience an unfortunate and hazardous landing on a set of high voltage 155kV power transmission lines. Power lines are incredibly dangerous, especially high voltage lines. When it comes to power lines, we don’t mess around. In the rare event of a power line landing, we immediately notify the power company and the local fire department. Usually, the power company is very accommodating and will come release the payload from the lines and get it back to you without too much trouble. When it comes to power lines – NEVER attempt to retrieve the payload on your own, even if it’s low enough to reach, cut or dislodge. You should leave this to trained professionals! Why do you use a fisheye camera lens? The fisheye lens doesn’t bother us. The Lightdow LD4000 action cameras provide perfect compatibility with our computerized systems for controlling on/off cycles, battery life, fault tolerance, fault recovery and reliability. The Lightdow LD4000 action cameras are very lightweight (47g) which allows us to place up to 3 cameras onboard each flight. The Lightdow LD4000 action cameras are very inexpensive which means we can afford to lose or destroy them every once in a while if things go wrong. We can use fisheye correction software tools if we really want to correct the imagery. Our goal is not to prove the Earth is round (or flat). It’s not our focus. You can’t see much curvature at 35,000 m in altitude. You can see some, but many mistake the minimal curvature for flatness. A high altitude balloon only reaches about 30,000 meters in altitude. This is only about 8% of the altitude that the International Space Station is at. You can see an actual representation of expected curvature by altitude using this curvature simulator. We understand that many dislike the fisheye camera lens, but we don’t intend to change our camera selection anytime soon. If you dislike it, we highly recommend designing your own flight with your own camera. We even have a how-to guide that shows what you need to know. It’s a great project, so give it a try! We’re here to have fun and get kids interested in science and technology. We hope you’ll have fun with us even with the fisheye lenses.